BRIDGEPORT VERT MILL WITH 2HP VAR SPEED, DRO, CHROME WAYS, S/N 264531. BRIDGEPORT VERT MILL WITH 2HP, DRO, P.F. TABLE, CHROME WAYS, S/N 280386. KITAMURA MYCENTER 3X CNC VMC, FANUC O-M, 10,000 RPM, 20 ATCH, SIDE MOUNT TOOL CHANGER, S/N 1883. SONIX IV, ULTRASONIC PARTS CLEANER. 15,000 RPM, 20 ATC, SIDE MOUNT, FANUC 16i-M CONTROL, S/N 12107. LARGE SELECTION OF CT-40 TOOL HOLDERS, SPRING COLLETS AND SUPPORT. KITAMURA MYCENTER 4 CNC VMC, FANUC 16i-M CONTROL, 10,000 RPM, SIDE MOUNT TOOL CHANGER, 40 TAPER, CHIP CONVEYOR, S/N 30666. KITAMURA MYCENTER 1 CNC VMC, FANUC O-M, 10,000 RPM, 20 ATC, SIDE MOUNT TOOL CHANGER, S/N 2919. MICRO VU VIDEO MEASURING SYSTEM, MODEL B2052. LARGE SELECTION OF INSPECTION TOOLS, GAGES, CABINETS AND SUPPORT. 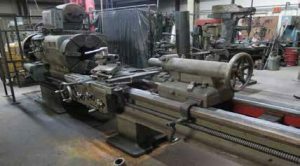 VICTOR 16’’ X 40’’ GAP ENGINE LATHE, 3 JAW 10’’ CHUCK, 5C COLLET CLOSER. 1997 AMADA HA-250W HORIZONTAL AUTO BAND SAW. TCH MODEL FCG-25, 5000 LB LPG FORKLIFT, SIDE SHIFT, 3 STAGE. GROB VERTICAL BAND SAW 18’’ THROAT WITH WELDER. DRILL PRESSES, LAPPING PLATES, HAND SHEARS. LARGE SELECTION OF CABINETS, SHELVES, AND RACKING. LARGE SELECTION OF HEIGHT GAGES, MICS, CALIPERS, VISES, KURT VISES AND ETC.